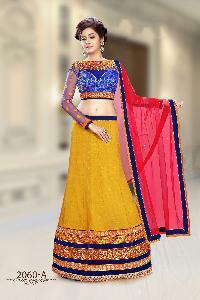 The 2060 Series Designer Lehenga Choli, provided by us, is known for its flawless stitching and fabric quality. Our products are subjected to the payment terms & conditions of our company. Patrons are provided with the terms & conditions, and can make purchases with a payment method best suited for them. Purchasers can trust our entire range, as it adheres to global quality requirements and is highly reliable.